Recently I've been thinking about making a battle report for TL. I've never made one but I've seen how other people make battle reports, so I think this will be ok for a first try. Image heavy post coming up! With terrible quality! 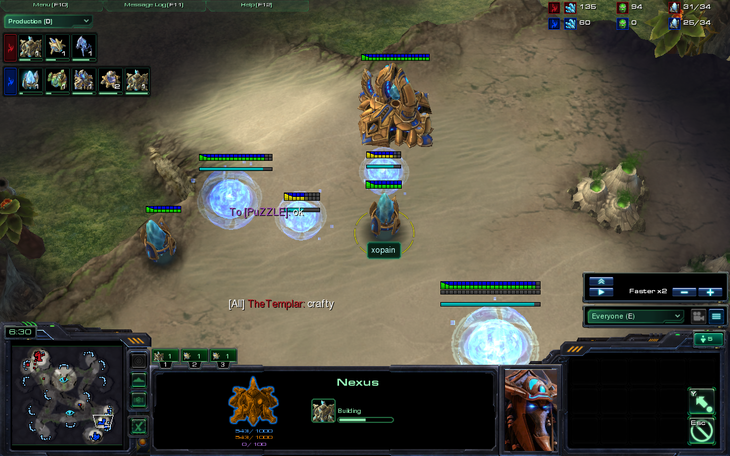 My opponent, the evil xopain, started in the bottom right as the blue protoss. 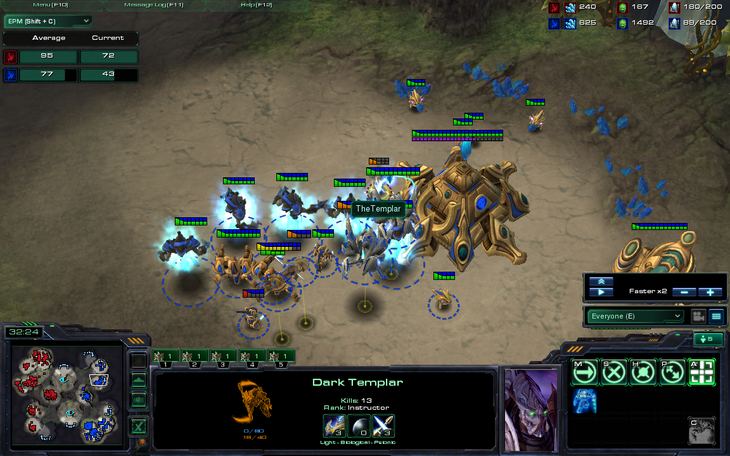 And the valiant and noble TheTemplar started in the top left as the red protoss. 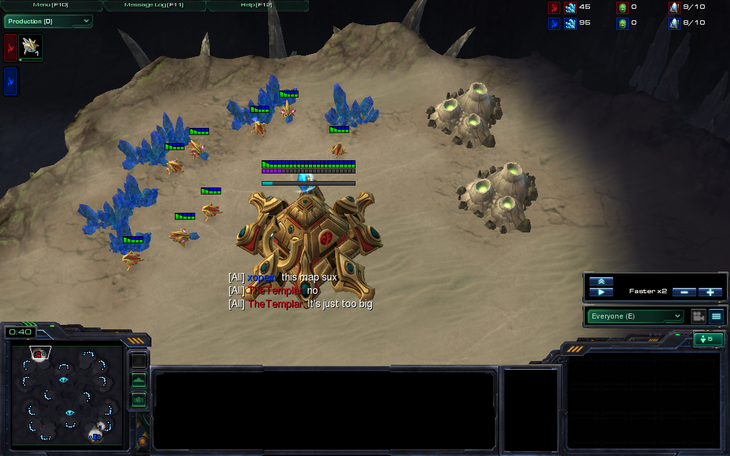 After a glgl hf from me and a gl from him, he expresses a profound dislike for the architecture of the map. Yes, this map definitely has the sux required. 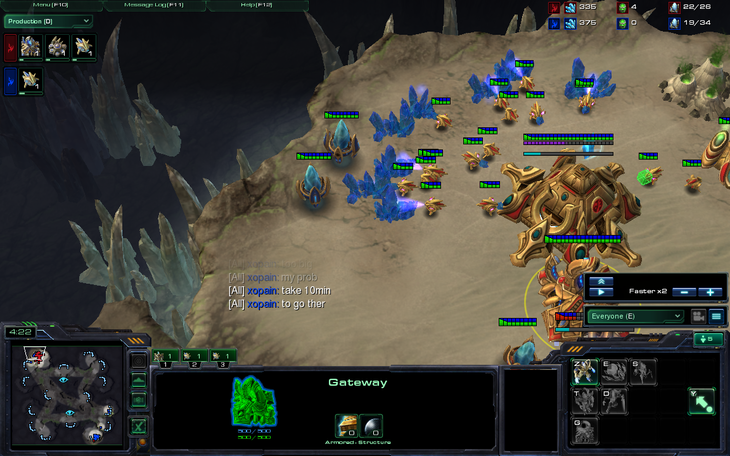 My opponent does the most standard PvP build in platinum league while I do an "unorthodox" 13 gateway 14 gas. But mom, all the cool kids cannon rush! 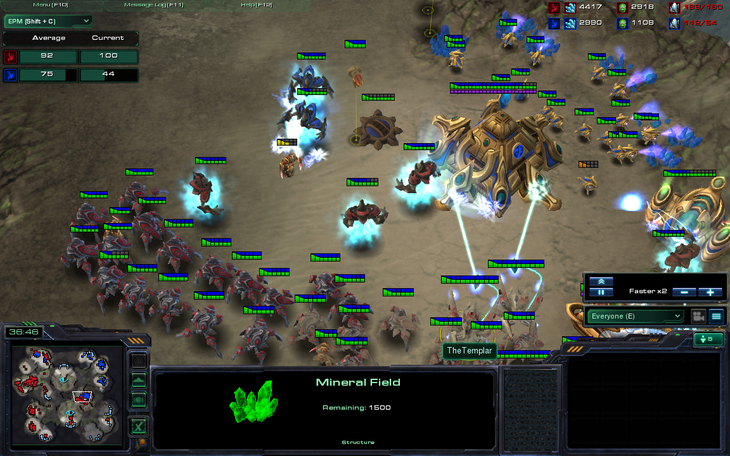 My opponent's evil plan is uncovered when he plants 2 pylons behind my mineral line. 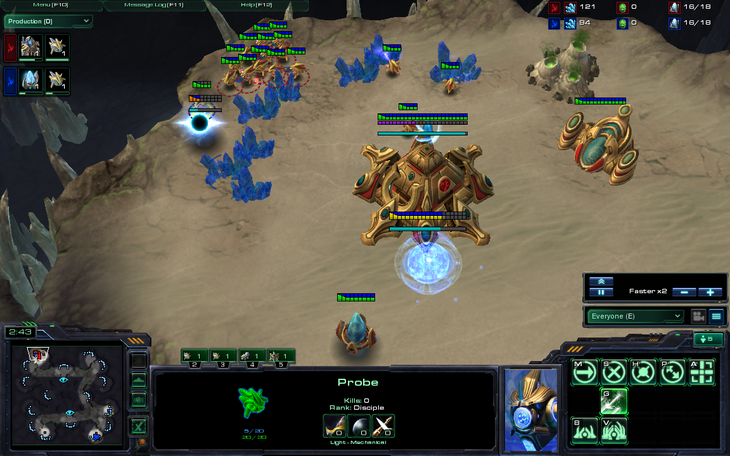 Probes are promptly pulled to kill the probe and any possible cannons. 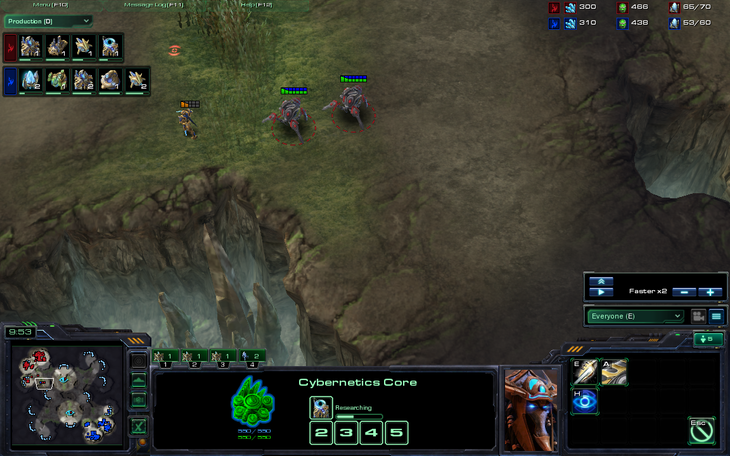 I kill the first probe, but he sends two more to try to break my nonexistant defense. He attempts 3 cannons, but all are shut down. 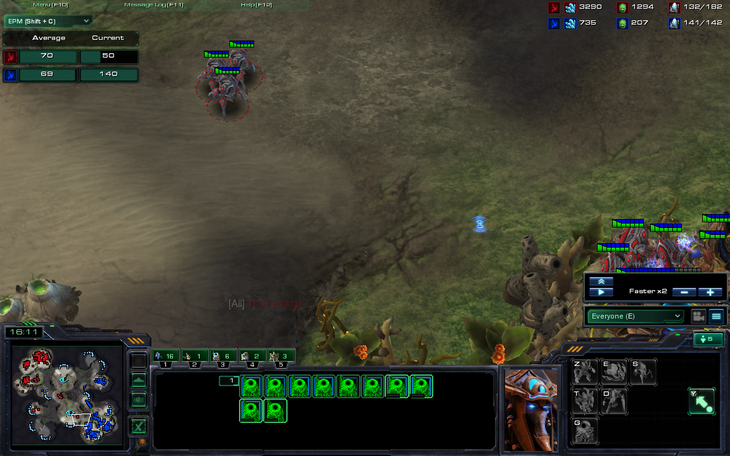 After I brag inform him about how awesome I am, he decides to test my bonjwaness by going for a macro game. Ok, cannon defense is over, let's play a 1v1. 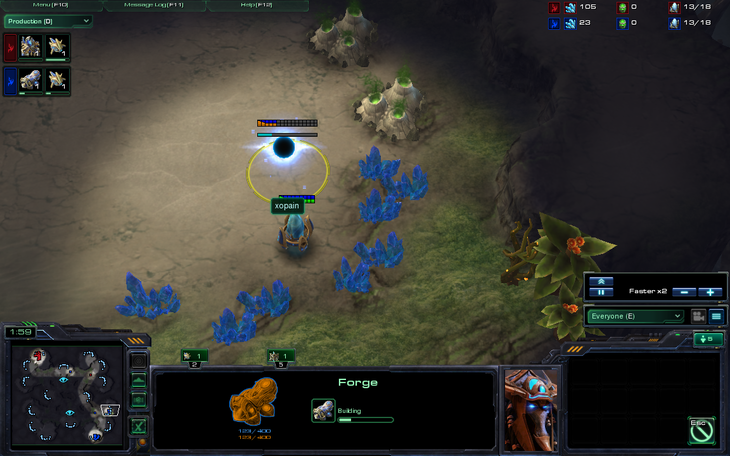 Unfortunately, I am experienced with the forge expand from playing ZvP with various people, so I take a page from the entire zerg race's book and take a fast third. 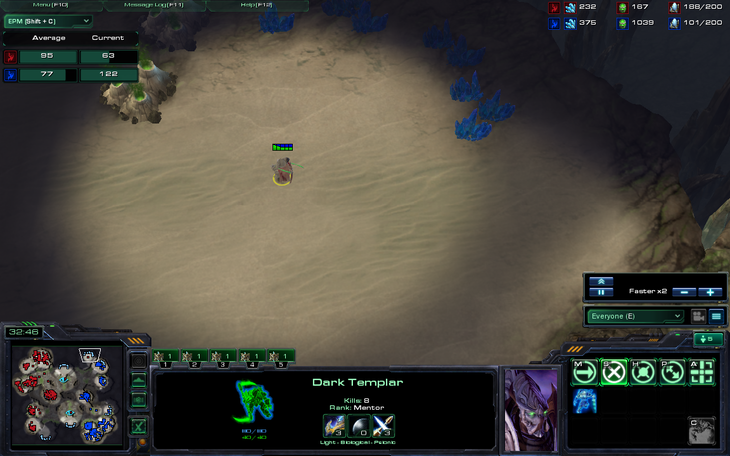 TheTemplar, the only person to have 2 nexii in production at some point every PvP. I deny his scouting of any expansions by killing all scouts with stalkers. Full economy, heck yeah! There's one problem though. 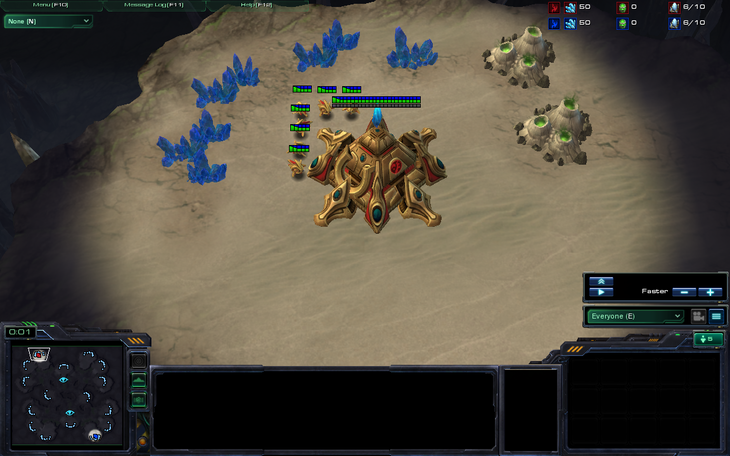 I was playing zerg so much that I forgot something vital. Fortunately, no warp gate was only a minor setback. After a while, I finally scout his forge blocking his third, which leads to a short conversation. I checked the replay and was absolutely positive he wasn't hacking. But how did he know about my expansions? Puzzled about how he knew I had a third, I continued to macro. 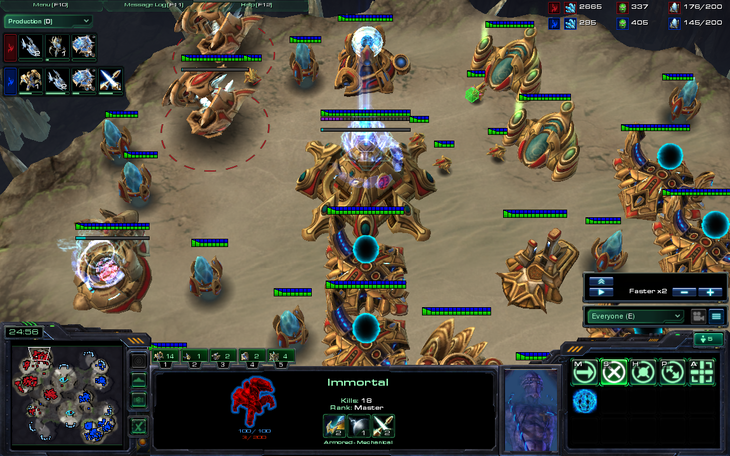 Meanwhile, he took a hidden third in the top left and massed immortals. 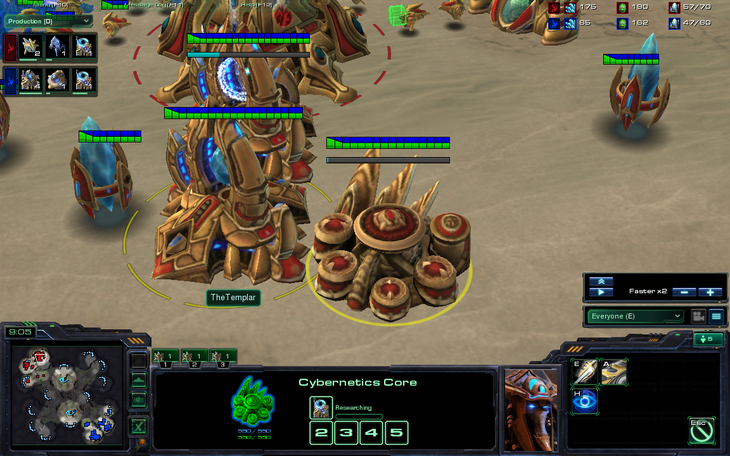 Knowing I was ahead in economy, I decided to do a blink into his base to take out tech in his main. Not pictured: My face as I realized I had 2500 resources and he had 300. 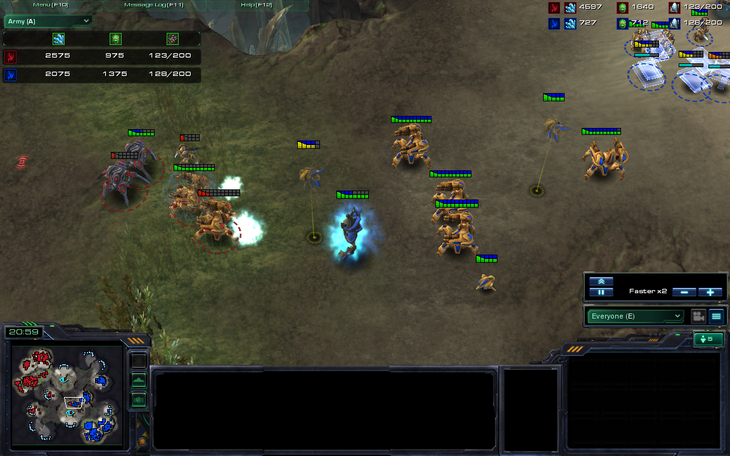 Then, in a split second of idiocy genius I accidently decided to suicide scout with all but 5 of my stalkers. At least I unpowered his gateways! Before you freak out about how terrible my attack was, about half the stalkers survived (big blob moving towards my base), but the ones pictured above were the ones that actually made it into the main. I was really scared about an attack, but I breathe a sigh of total relief as I see he's sitting back and expanding. Nice fourth third base you have there, mister. Then, we meet in the first REAL third battle of the game near his third fourth base. 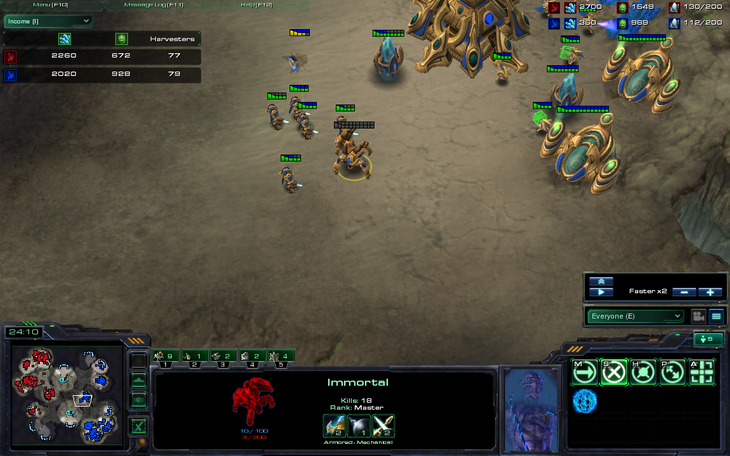 After a bit of macroing where I get more zealots due to his immortal count, we clash in exactly the same spot again. 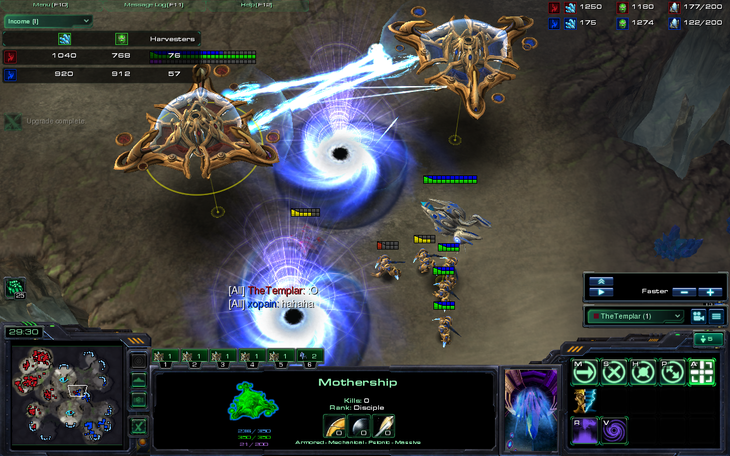 Somehow, we both tech to mothership and void rays at nearly the same time, leading to a very interesting production tab. Having scouted expansions to the north, I go for his fourth third base. Note that he still hasn't taken his actual third base . Then another close battle ensues outside of his third base. Towards the end of the battle, I am reminded of a bit of wisdom Day gave us during one of his funday mondays. 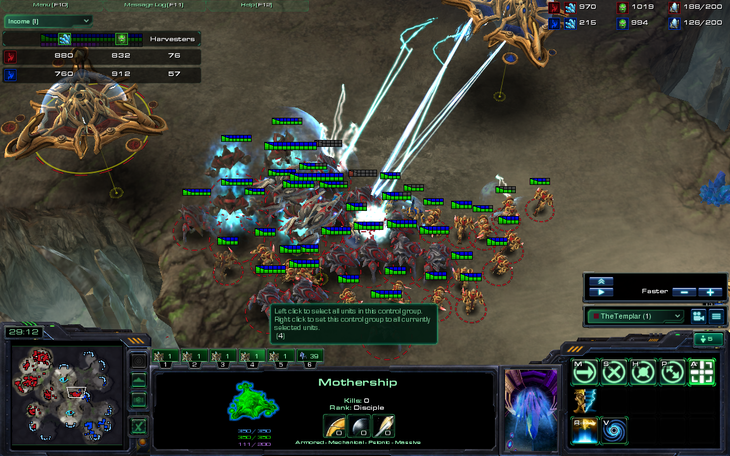 Since I have only ever had one game with a mothership from both sides at the same time, I was relatively confident he didn't have a mothership, so I didn't bother with an observer. This is the equivalent of winning $1000 in a lottery and then having to split it with your worst enemy. And then both of you loan all your prize money to a total stranger. And then he actually pays both of you back the next day. 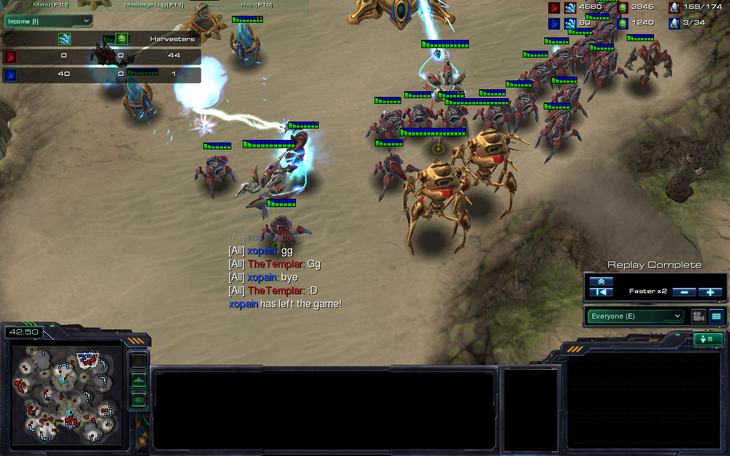 And then your opponent wins a battle involving two motherships. 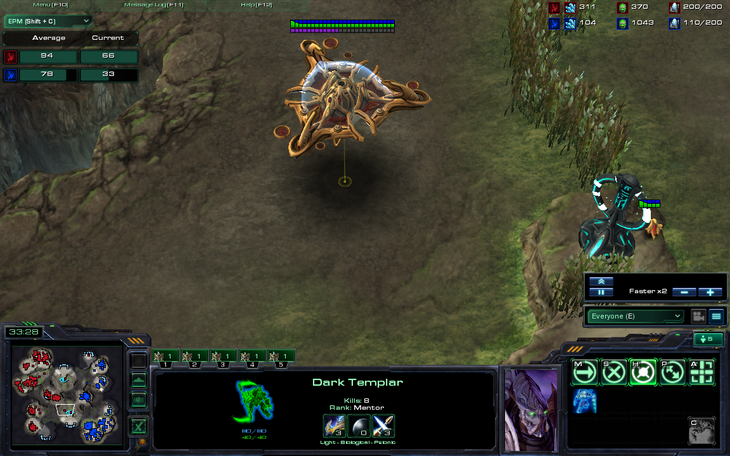 I believed I was ahead, so I broke one of the fundamental rules of Day and used DTs for something besides archons. 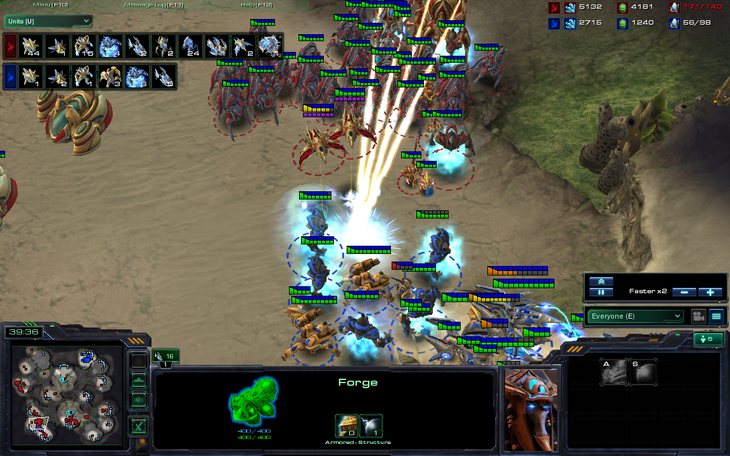 The second DT later dies to a single photon cannon. My mothership decides to take a journey around the entire world in 80 days across the map. Her purpose in life is realized with a battle cry and two clicks. 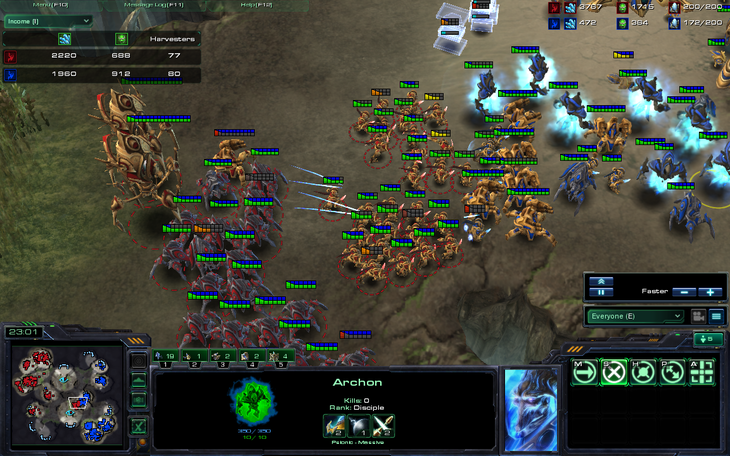 My opponent, seeing my army is larger than his and invisible, goes for the base trade. 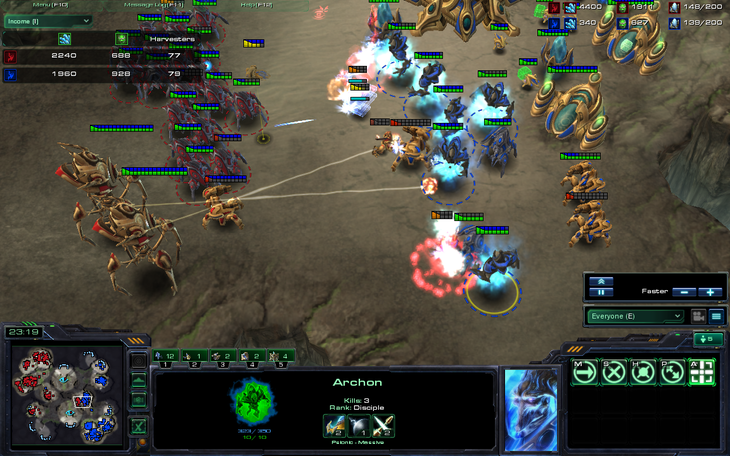 I pick up some stray archons at his third fourth base. They put up a feeble valiant defense, but fall. 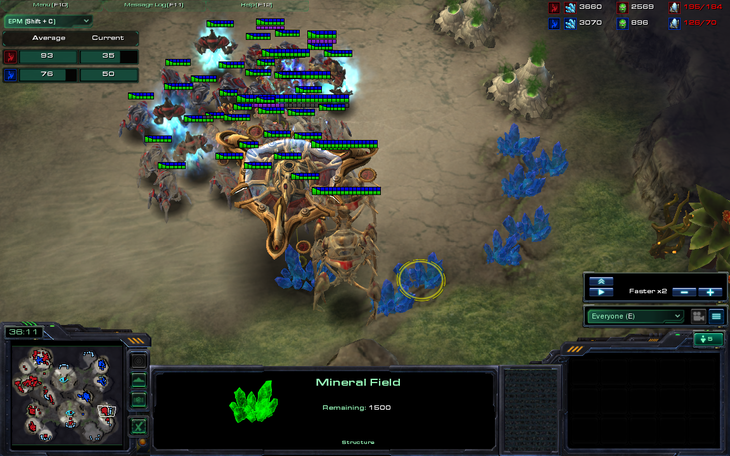 I thought I had killed every base, so I went back to kill his army. I think that I won the battle. 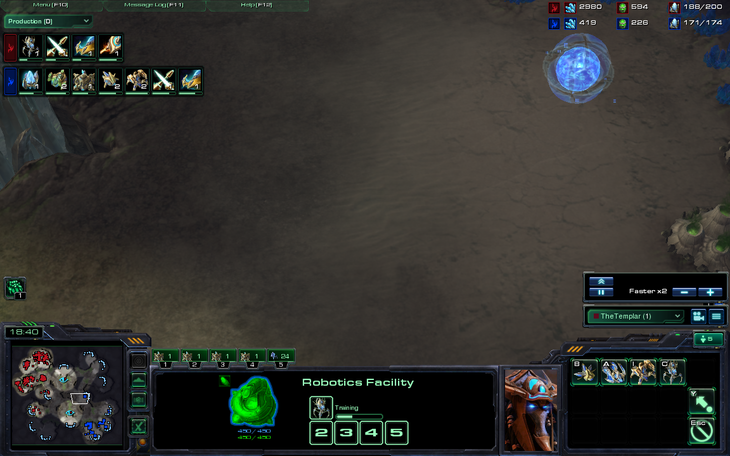 Wildly confused about him not having any bases, I sent patrols around a map, including an observer. 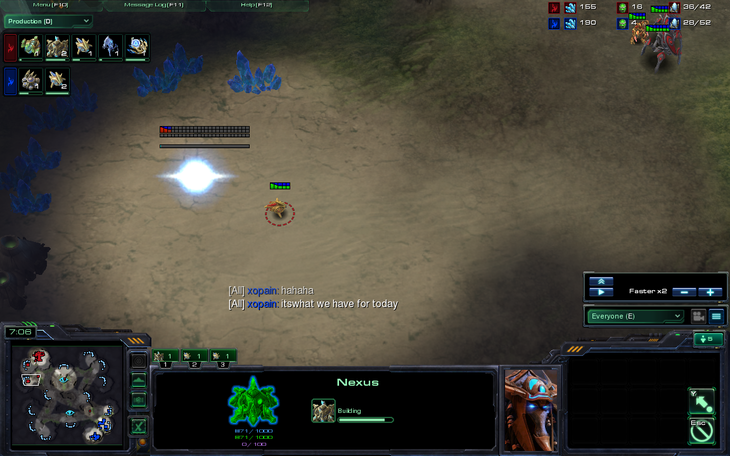 This happens every time I win a base trade against a protoss. Sometimes they make a mothership so they can have cloaked cannons. 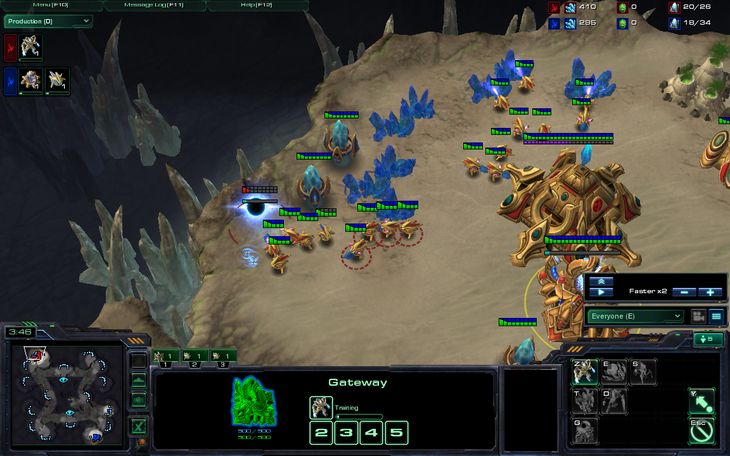 I charge into his base. Dancing zealots are crucial in most battles. The game was won by none other than myself. im laughing at that one lonely phoenix. 5/5 rofl that was hilarious. You seem much like myself in some ways :p. Also, nice sig lol. Loved all the jokes. I can't choose my favorite. The lottery and dancing zeals though.... lolz. 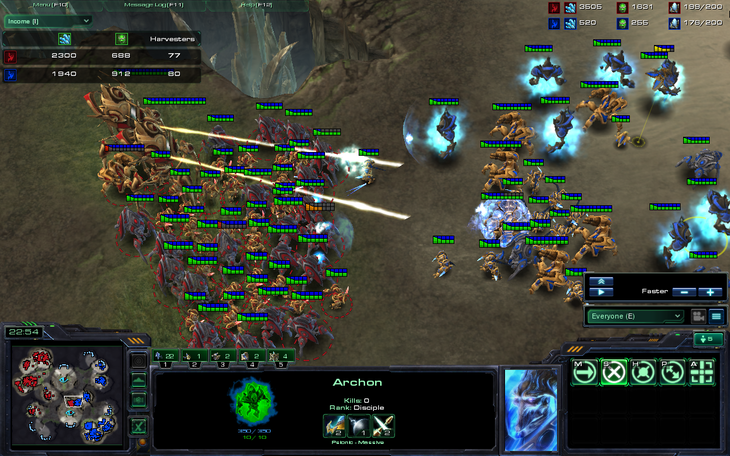 And in my world of BW official b.net a cannon rush is only for skilled pros. And cannon rushes require a lot of skill, I agree. And yeah I always like reading battle reports, especially hilarious ones LOL--dat late warp gate....and...dat epic game in generally O_O well-played, that was a fun game just to read about (which is the intention ofc)! The best games come from terrible, terrible mistakes in my opinion (which is what makes this game good- if I had attacked at the front near the end the base trade would have never happened, for example). And yeah, that's a pretty good point hehe. I guess it's a mixed blessing to make mistakes then...on one hand, boo mistakes=greater chance of losing, and on the other.....awesomesauce battle reports. ...Anyone else thinking what I'm thinking? edit: Also, tehtemplar and I could turn our PM's into a BR lol. I wish every troll was this nice :O, that was really awesome though haha. Lol. I had to go to bed right then too. /i do not believe 3FFA or xopain were trolling. What are you talking about? 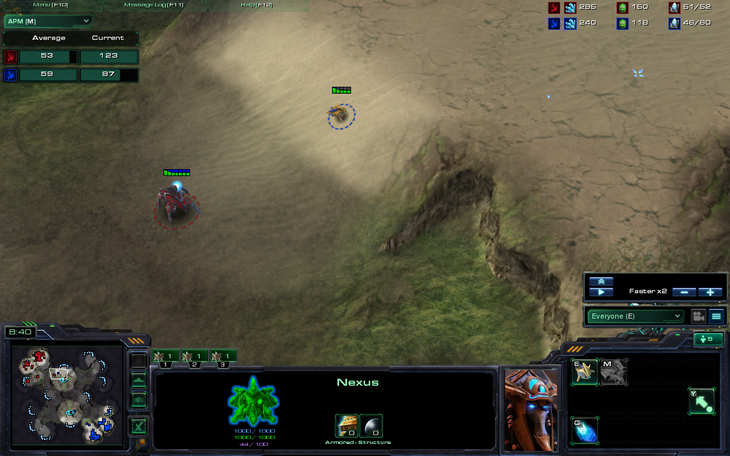 Lol I just realized something... there are no terran or zerg here . 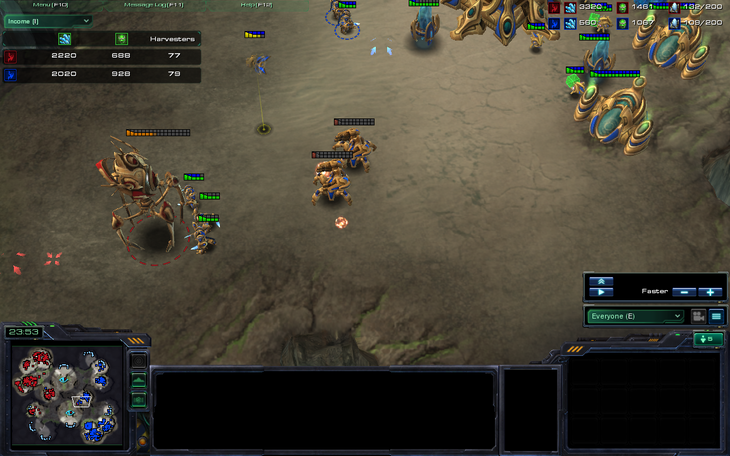 Also, I just played the craziest 1v1 (BW) ZvP game that I think I'll make a BR out of next week. I'll make it from my vision being the only one shown.